Stern Saver Mini glue-on transducer mounting system for Panoptix Transducers (White color). Mount transducers without drilling damaging holes in your boat! 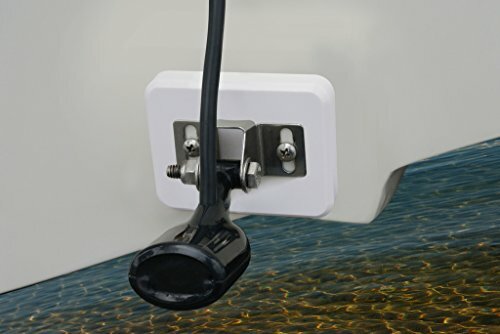 Just glue this specially-made StarBoard plate with included high-strength marine-grade adhesive and mount transducers to it without drilling any holes in your boat! No tools necessary, pre-packed with everything you will need for installation. Installs in ten minutes or less. Prevents costly repairs associated with transom rot and water-logged foam cores! Forms a super strong mechanical bond to your boat. Can be drilled and re-drilled multiple times. Allows for easy transducer adjustments to find that "sweet spot". Seals and conceals existing holes in your boat's transom. The toughest, most durable transducer mounting system available. Fabricated from marine grade polyethylene plastic, not injection molded low-grade plastic. This product can be used with Lowrance, Garmin, Furuno, Humminbird, Eagle, Raymarine, Simrad brand fish-finders. Not recommended for StructureScan or side-imaging transducers. 100% Made in the USA. 3.5" wide X 2.5" tall X 0.75" thick. Can be drilled and re-drilled multiple times. Protects your investment and improves boat's resale value. If you have any questions about this product by Stern Saver, contact us by completing and submitting the form below. If you are looking for a specif part number, please include it with your message.